HealthAid Ginkgo Vital 3 Siberian Eleuthero & Ginseng is the finest ginkgo capsule available with siba dietary supplement which helps to increase blood flow to the brain. Ideal for maintaining mind and mood, improving energy levels and may support healthy circulatory function. Soybean Oil, Gelatin, Glycerol, Purified water, Lecithin (Unbleached), Yellow Beeswax, Titanium Dioxide Colour. As a dietary supplement, take 1 softgel daily upon rising, wait 20 minutes before eating. 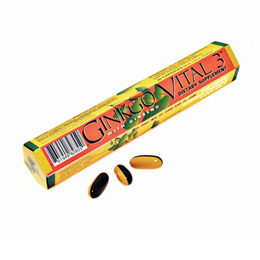 Below are reviews of HealthAid Ginkgo Vital 3 - 30 x 100mg Softgels by bodykind customers. If you have tried this product we'd love to hear what you think so please leave a review. HealthAid Ginkgo Vital 3 Siberian Eleuthero & Ginseng is a dietary supplement which helps to increase blood flow to the brain. Known for helping with mental alertness and alleviating stress.